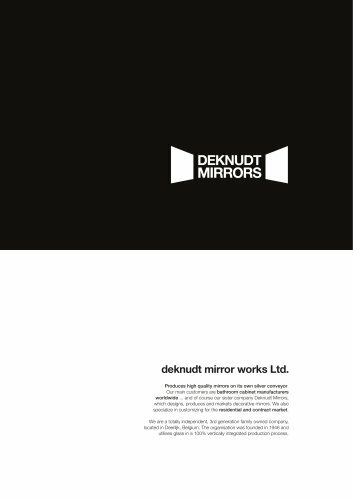 deknudt mirror works Ltd. Produces high quality mirrors on its own silver conveyor. Our main customers are bathroom cabinet manufacturers worldwide ... and of course our sister company Deknudt Mirrors, which designs, produces and markets decorative mirrors. We also specialize in customizing for the residential and contract market. We are a totally independent, 3rd generation family owned company, located in Deerlijk, Belgium. The organisation was founded in 1946 and utilises glass in a 100% vertically integrated production process. best quality standards ISO 9001 certiﬁcate innovative market leader deep respect for european legislation quick & ﬂexible deliveries open & loyal partner curious? Our website can tell you all the details about any of our products or activities. Visit www.deknudtmirrors.com and pass on to the section bathroom mirrors. Let’s connect if you are interested in talking to us about possible partnerships. Deknudt Mirror Works, VAT BE430.064.643 Kasteelstraat 10, B-8540 Deerlijk, Belgium t +32 (0) 56 73 25 60, info@deknudtmirrors.